Chinese philosopher Lao Tzu once said “Knowing others is intelligence, knowing yourself is true wisdom.” Mindfulness is a gateway to discovering that wisdom and increasing your focus and clarity. Understandably, many of my community members have heard about the benefits of mindfulness. But they are skeptical. The thought of sitting in a meditative pose for 1 hour a day is daunting. Yet they have heard about the medical and business benefits of living and working mindfully, and want to escape 24 x 7 “always on” digital demands. For that reason, they often ask me how they can incorporate mindfulness—which I define as the ability to stay present and focused on the current task at hand without judgment—into their workday. The art of high noticing is one of my favorite methods. It is very difficult to live “lights on”—or live with passion and high energy—if you are unable to notice subtle shifts from one day to the next. Without a high noticing ability, people, places and things start to look and feel monochromatic and mundane. If you are buried in your smart phone or proud of constantly multitasking, it is virtually impossible to distinguish how things are different from a previous state. In addition to working with over 2,500 senior executives and leaders, Clarity© has taught me to rapidly notice when my thoughts and actions are draining and ineffective. I can rapidly recover from those patterns by shifting my thoughts, words, and actions in another direction. As a high noticer, you are able to follow your energy and determine whether you are expressing draining and negative behaviors. These may include fear, exhaustion, anxiety, overdoing, or habituation. (Do any of those behaviors describe your work style, or am I alone on this one?) Conversely, “lights on” (higher energy) behaviors foster effortlessness, service mindedness, enthusiasm, excitement, and visionary thinking. How would your workday look differently if you could make some subtle shifts in your thinking? This one simple exercise is a step in that direction. It will help you become a high noticer—and you won’t need to become a yogini or monk to achieve it. In this keynote, I shared the stage with Bozzuto’s CMO, Jamie Gorski. 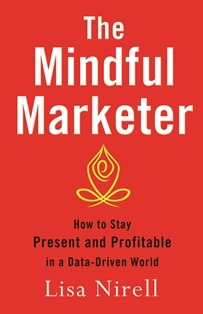 She is a mindful marketer who has embraced high noticing. In just one minute, shift can happen. Will you be there to notice it? Tell me what you think in the comments below.